There are lots of places out there advertising solutions to hair loss, but you can be certain that they’re not all the same. Some solutions like medication don’t work if you stop using them. Procedures such as strip surgery can be painful. Patients also want the results to be healthy and natural looking. Thinning hair can leave emotional scars and patients deserve a healthy permanent solution. RHRLI has that permanent solution. It’s called the ARTAS® System and it uses robotic technology to give you a full healthy head of hair. RHRLI is proud to be the only hair treatment center on Long Island to offer this cutting edge procedure. The ARTAS® System uses robotic technology to conduct a hair transplant that will be minimally invasive and virtually pain free. We believe that the ARTAS® System is the best option available for hair loss treatment and one of the biggest reasons for that is the incredible precision of the system’s robotic arm. When you come to RHRLI, the first step in the process is your consultation with our board-certified surgeon, Dr. Baiju Gohil. Dr. Gohil has been practicing for more than a decade and he meets individually with all of our patients. He’s also involved in all aspects of every surgical procedure. Dr. Gohil will talk to you about your treatment options and will design a procedure that fits your individual needs. Then it’s time to put the ARTAS® System to work. Our robotic technology is approved. The system was created to eliminate the guesswork and fatigue associated with other Follicular Unit Extraction (FUE) procedures, which involve using manual handheld devices. Unlike Follicular Unit Transplantation (FUT), which is known less formally as “strip surgery,” you won’t need stitches and you won’t have an ugly scar. Your hair transplant will be as natural as they come and the procedure will be virtually undetectable. Your hair will be selectively harvested with robotic precision. We use advanced algorithms to pick the best hairs for transplant, while at the same time preserving the natural look of the donor area. The ARTAS® robotic arm will provide speed and harvesting accuracy unlike any other hair transplant procedure available. The ARTAS® System protects your existing healthy hair while providing healthy replacement hairs where they’re needed. Because it’s minimally invasive, recovery times will be quicker than other types of hair transplants. You’ll be back to regular activities within a few days. If you come to RHRLI, you’ll quickly learn about the ARTAS® difference. We will give you the most natural looking hair transplant you can find. 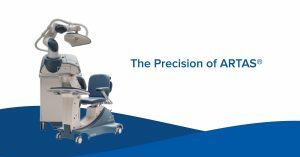 We’re the only practice on Long Island that offers ARTAS® so we’ll always deliver treatment with precision. Contact us today to learn more about RHRLI and the ARTAS® system. Please note, that the author of this piece is not a doctor and the information in this material is not intended as medical advice. Please consult your doctor or medical professional for specific information regarding your individual situation.